The 21st Century Cures Act: What Is It And How Does It Affect Scientific Research? The House of Representatives approved the 21st Century Cures Act on July 10th, 2015. The bill, which was drafted by the Energy and Commerce Committee in the House of Representatives, hopes to “accelerate the discovery, development, and delivery of life saving and life improving therapies, and transform the quest for faster cures”. There are around 10,000 diseases and conditions currently known, however, there are only cures and treatments for 500 of them. Furthermore, it can often take decades for new discoveries to be translated into therapies for patients. Thus, the 21st Century Cures Act aims to solve these current problems in the biomedical research field by improving certain aspects of how the National Institute of Health (NIH), Food and Drug Administration (FDA), and Centers for Disease Control and Prevention (CDC) operate. 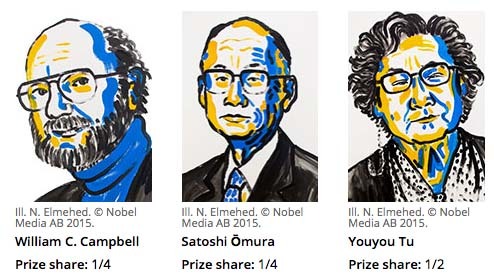 On October 5th, 2015 the Nobel Prize for Physiology or Medicine was awarded to William C. Campbell and Satoshi Omura for “their discoveries concerning a novel therapy against infections caused by roundworm parasites” and awarded to Youyou Tu for “her discoveries concerning a novel therapy against Malaria”. These three scientists were instrumental in identifying the compounds now used as standard of care for many parasitic diseases.